In a medium bowl, toss together shrimp, olive oil, garlic, pepper flakes, salt and pepper. Let marinate 15-30 minutes while you start up the grill and bring a pot of water to boil for the pasta. If using bamboo skewers, soak in a shallow pan of water. Skewer shrimp and grill until just cooked through, flipping skewers over to get grill marks on both sides. Cook pasta according to package directions; drain. 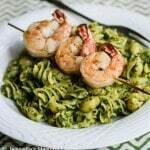 Toss with pesto and a little pasta cooking liquid or water to loosen up. Add some romano cheese desired. Top with grilled shrimp.